Received my right handed “like new SLDR 3 Hybrid today. “Like New” might as well be brand new. It’s flawless and mine included a head cover. Haven’t swung it yet but seems like another steal from RBC. My pre owned club came brand new without a head cover and adjustment tool. This was a pleasant surprise to say BRAND new. I also caught the scratch in a pricing error while my club was in transit and they honored the $35 price drop by doing the right thing despite not having to do so. I’m a big believer in RBG and my many experiences prove they will make it right no matter the issue large or small. Thanks RBG! One of the best looking drivers at address right now. Classic, timeless pear shape. No logos. Forgiving. Stock Miyazaki shaft is a mid-launch, mid-spin shaft. Still have this driver as my "backup" and have had it in the bag the last week+ while I deal with shaft issues on my newest. Basic review: Just as long as any other driver I've hit, longer than most. Forgiving. Sets up nice. I like the crown design for aiming. The reason it doesn't stay in my bag? It's LOUD. Drivers really needed warning labels and ear plugs not long ago. Very nice quality! Love the club. I have only played 27 holes here in Michigan on slower early season greens, but love this putter so far. It is well balanced and nice weight to keep my stroke smooth. I haven’t missed a putt from inside 6 feet yet! So excited and can’t wait til it’s time to play sped up greens to let this putter do the work! Very pleased, beautiful design, almost brand new and can’t beat the “like new” price. ProsAmazing super stroke grip, great balance and weight. ConsNo cover, but not complaining for $70.00! Easy to hit with and very forgiving. Callaway Golf XR OS Hybrid are awesome. If you want forgiveness with ease of hitting and distance then get these hybrids. I liked my hybrid 4 so much I got the 5 and 3. I love this new driver I've added another 30 yards to my drives! Feels good in my hands can't wait to go out and play some more with it! The Taylor made rescue highbred is a fantastic Club. I had an older model Taylor made rescue hybrid and just wanted to update it to an M4 and when I hit the ball shoots out like a cannon. It is a nice club and it is in great condition. The sound is a little odd to me. It does what I need it to do. I recently purchased a pre-owned Callaway LLH Big Bertha Fusion fairway wood. When I received it I was very impressed as it looked like new. 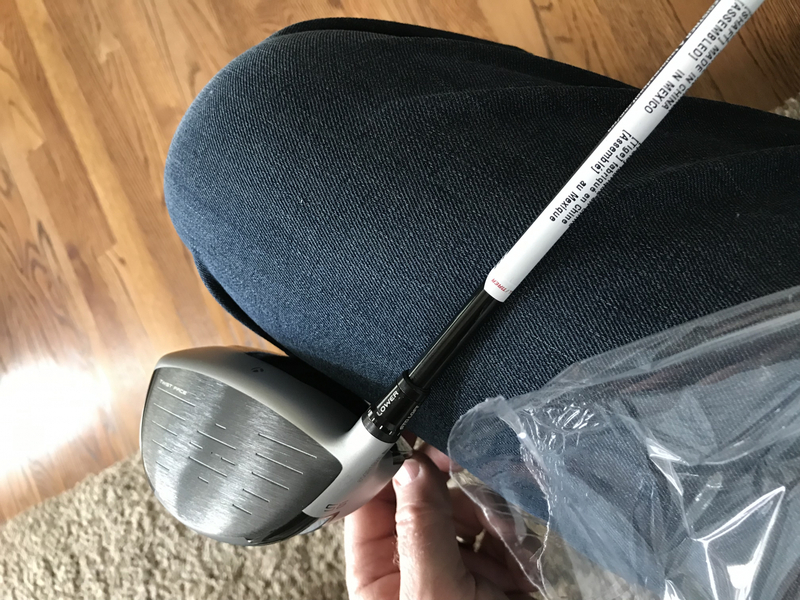 This past winter after my driver cracked (no I didn't hit anything other than a golf ball with it) I was fitted at a local golf store and bought a senior mens granite shaft 13 degree loft Big Bertha Fusion driver and wow what a difference it has made on the tee. I have always had a difficult time finding LLH clubs in local stores so was happy to find RBG carried them. So when I decided to up grade my fairway woods and found this on RBG I was thrilled. Yes it performs beautifully. Small head, but still forgiving and easy to launch. Love the stock speeder shaft. Enjoying these clubs. Money well spent. Highly recommended..
ProsGreat club to work shots. Looks new. Can not find a mark on it. Fifteen more yards on my drives. This is the second Cleveland putter I have purchased from RGB. Totally satisfied with feel and the roll it imparts on the ball. It's good to have a second putter to put in the bag when the other cools off. RGB's lower prices makes it easier to have backup clubs. Easiest 3 wood I have ever hit. The draw bias really helps keep the ball going straight and not slicing. RBG has great prices and delivers what you want. Very nice putter! Great feel. This putter looked brand new. This is an excellent way to get what works and finally I have a driver that is working. I like it so much, I ordered a second one from Rock Bottom. Excellent condition arrived like new and exceeded all expectations from quality standpoint. Unfortunately I have not been able to hit the club with desired accuracy I had hoped so the search for my perfect hybrid is still on. Produced a good ball flight and distance for me and setup was appealing as well. Club was as good as advertised! Very pleased with the purchase. Better than I expected. Clubs were like new and delivered as advertised. Very satisfied. Purchased this pre owned club, tried a few times. So far feel and look are what i expected. Would recommend looking at rock bottom’s pre owned section for some good buys. Nice soft feel off the face. Looks good too! Bought this to replace Top Flite iron. Club was in good condition, even for being listed as "value." Grip is worn but I replace them anyways. Hits great, can't beat the price. ConsUPC sticker on the shaft...a chore to remove without scarring the graphite shaft...need to start using removable stickers!!!! Club is a Preowened 29* 6 iron/ wood rated "like new". It appears to be new, but when you look real close you can tell its been hit a couple of times. Received club per delivery date. Haven't had a chance to hit it yet but sure I'll be a happy camper. 4-stars is because of not having opportunity of hitting. RBG is a excellent site..... been purchasing from then for 10+ years. Never a single issue. I was impressed with the condition of this Nike club that I bought from Rock Bottom. It looks brand new! Plus, they threw in a club cover too. GREAT DEAL for me! Great driver for price! Shaft was worth purchase price alone. Highly recommend!